When you first teach your child the numbers 1, 2, 3 and so on, they mean very little to him or her. It is only when you use objects to count, will the numbers mean something. Counting with numbers helps your child understand that numbers refer to quantity (how many); then numbers become meaningful. This paves the way to understanding harder Math concepts. Your child should be able to count from 1 to 50 in Kindergarten and up to 120 in Grade 1. Let’s start with numbers from 1 to 100. You can also apply the following counting games using numbers of any magnitude. 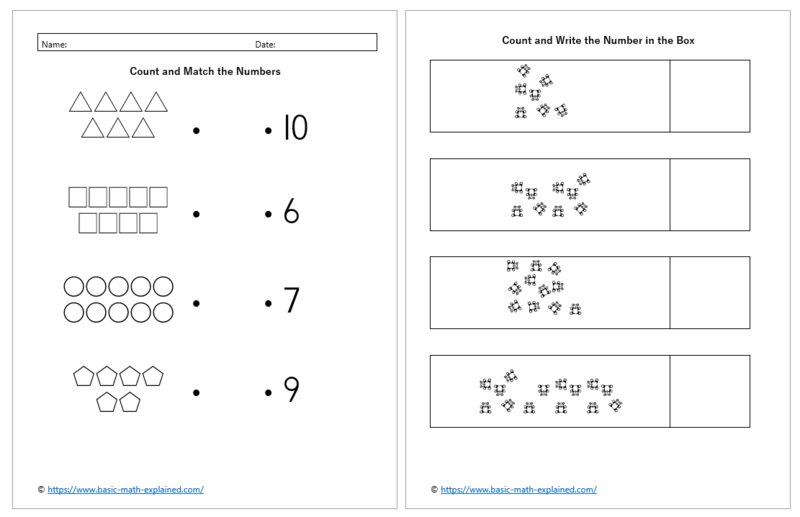 I have created a 9-page chart of Counting Numbers (1 to 100) for you to use with your child. 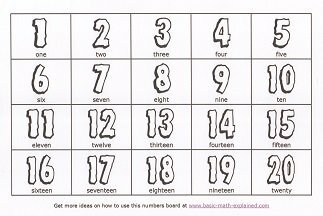 This is useful as a reference to learn the sequence of numbers. Print out one set (pages 1 to 7) on thick paper like card stock or similar. This is your master set. Laminate the pages and place them in a file for your child to use as reference. Use this chart in the activities below. Counting Numbers written in symbol form (1, 2, 3...) are also called numerals. Numbers can also be written in words. 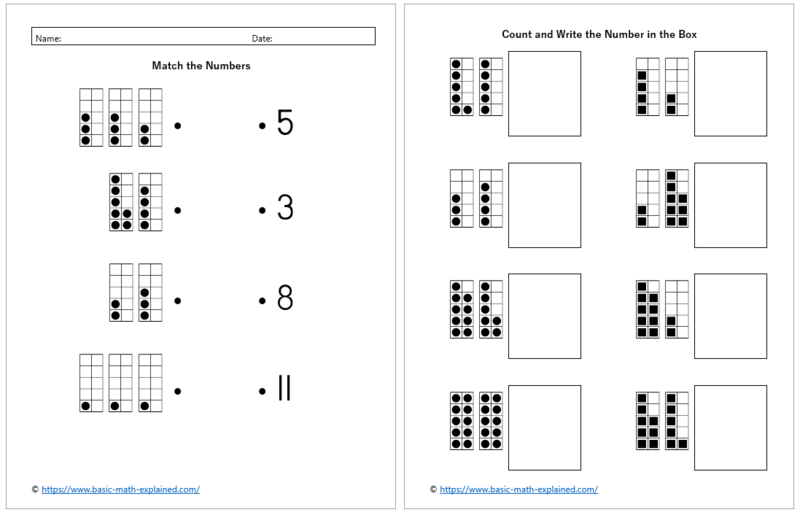 Use the number chart to teach your child to recognize a range of 10 numbers at a time. Practice 2 or 3 times each day. Say the number while pointing to the corresponding numeral until your child can recognize the numbers. It's more fun to take turns with your child to say the numbers.You can go faster and faster after your child has learnt the numbers. 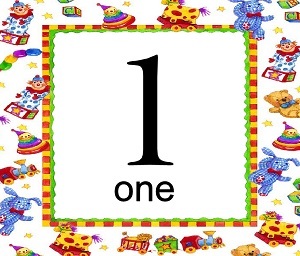 You don't always have to start at 1, especially when your child is learning the bigger numbers. If there are more players, have everyone stand in a circle. Throw a soft ball or even a soft toy to one person at a time. The player who catches the ball has to say a number in sequence. This way kids have to pay attention to the order of numbers and be alert to their turn. Remember not to overwhelm your child. Let him go at his own pace to enjoy learning Math and not be stressed out by it. Children learn best by repetition and practice. 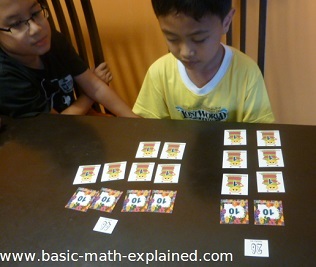 Play these games till your child feels comfortable with numbers and can recite them instantly. CLICK HERE for more on Number Sense. Here are some worksheets for you to use with your child. You can print the worksheets one page per sheet of paper or 2 pages per sheet of paper. You can print them in any order you like. Answers are included. Make it easy for your child to learn through frequent practice. Just 2 pages a day is enough. 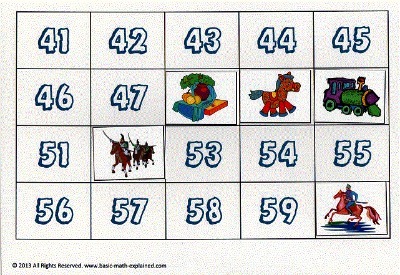 Use the pictures that you’ve cut out to cover some of the numbers on the number chart. Uncover the numbers as your child says it so she gets immediate feedback on whether she is right or wrong. To make the game more challenging, cover a few numbers in a row then test the number in the middle. If there are more players, the first player to call out the answer gets points. The player with the most points after 10 rounds wins. 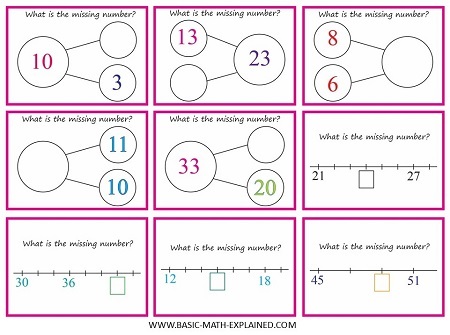 Using pictures to cover the numbers is the start of helping your child develop algebraic thinking. In algebra, letters are used to represent numbers. Use the following great games to help your child learn numbers. Play them with family and friends. Arrange the numbers in order of size. Picking out all the multiples of 7 from the pile of numbers. Get more resources by clicking on the pictures below. In Grade 2, students are required to know numbers up to 1,000. Point out the pattern found in numbers: all numbers follow the pattern of 0, 1, 2, 3, 4, 5, 6, 7, 8, 9. Print out the cards found here and play Guess the Number Game. Help your child see that the place of a digit determines its value. The digit '1' in 210 has a value of ten. The digit '1' in 198 has a value of a hundred. Learn more on Place Value. So that's how addition works! Watch the video to get more ideas on using place value. This will be extremely helpful later on when your child learns addition, subtraction and multiplication. 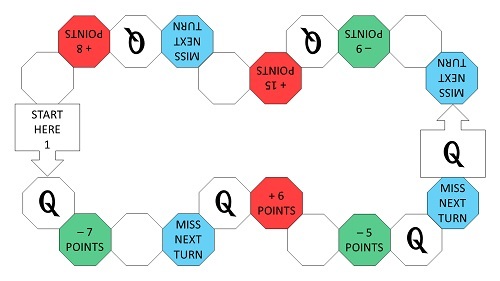 Use the numerals that you cut out from the number chart for this game. Place various objects in little boxes (the disposable plastic boxes used for food works well). You can use sweets, stickers, whatever your child likes. Put the boxes in different areas of the room. The objective of the game is to count the items in the box and place the correct numeral next to it. Place the boxes in hard-to-reach places to make the player jump, bend and stretch. This kind of active learning makes Math fun. This can also be a contest if there are more players. Example: The winner is the first player to find the box with 35 items in it. Here are more ideas for items to put in the boxes: Lego blocks, small toys, beads, paper clips, craft items and buttons. Make counting numbers a part of your child's everyday activities. Next step, go to basic Math skills. Give your child 10 consecutive numbers from the numbers you've cut out. Consecutive numbers are numbers that are in running order, like 21, 22, 23. Ask him to arrange them backwards, that is, starting with the biggest number. Let him check his answer using the chart. 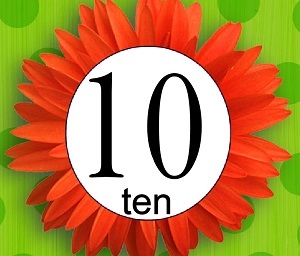 In Kindergarten and Grade 1, children must learn to count by 10’s. In Grade 2, they must learn to count by 5’s, 10’s and 100’s. 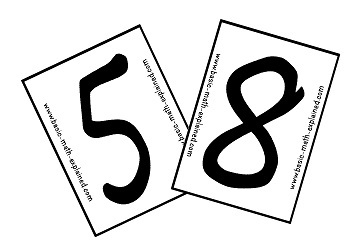 Use the picture cards that you've cut out to cover the numbers being tested. For example, in counting by 10’s, cover the numbers 10, 20, 30 and so on up to 100. This game is great for using up some of your child's energy before settling down to do written work. Place a basket of items at the far side of the room. Stand with your child at the other end of the room with an empty basket on the floor. Your child must run to the basket to pick out the correct number of items and drop them into the empty basket. If the number is big, your child may have to run back and forth a few times. Take turns with your child to run and get the items. 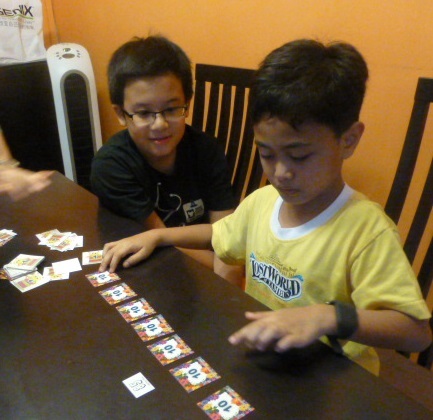 This is also a great game for a group of kids to learn together. 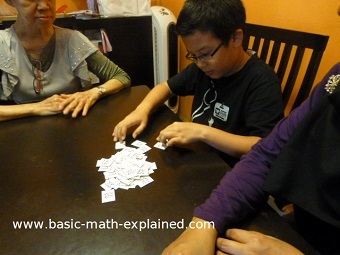 After learning to count, your child must progress to gaining other basic Math skills. Click here for explanations of Basic Math Terms.